America’s leading advocate for and internationally recognized expert on tropical diseases and vaccine development, Dr. Peter J. Hotez MD PhD, delivered testimony on June 27 before the United States House of Representatives Committee on Foreign Affairs Subcommittee on Africa, Global Health, Global Human Rights and International Organizations Hearing. In his presentation, entitled “Addressing the Neglected Diseases Treatment Gap,” Dr. Hotez, who is President of the Sabin Vaccine Institute (Sabin), founding Dean of the National School of Tropical Medicine at Baylor College of Medicine, Professor of Pediatrics and Molecular Virology & Microbiology and Chief of the Section of Pediatric Tropical Medicine at BCM, Endowed Chair of Tropical Pediatrics at Texas Children’s Hospital, heads the Children’s Hospital Center for Vaccine Development, and recently named the Fellow in Disease and Poverty at Baker Institute for Public Policy at the Rice University, explained to the lawmakers the importance of U.S. investments in neglected tropical diseases (NTDs), the work of Sabin and the Baylor School of Tropical Medicine, and suggested ways the U.S. government could refine its strategy to more effectively help those who suffer most from these devastating diseases. The Sabin Vaccine Institute Product Development Partnership (Sabin PDP) collaborates with partners from across the globe to develop new, safe, effective, low-cost, vaccines that have essentially no commercial market for tropical infections and other diseases that form a category known as “Neglected Tropical Diseases (NTDs), and that primarily impact the world’s poorest populations in developing countries, including human hookworm, schistosomiasis and Chagas disease. With aspirations to extend these activities to the Middle East and Asia. Dr. Hotez writes extensively about vaccine diplomacy — the opportunity to use vaccines as instruments of foreign policy and to promote global peace. On May 14, 2012 the executive committee of the Texas Medical Center’s board of directors voted to approve the membership of the Sabin Vaccine Institute, making it the 51st member institution of the world’s largest medical complex. Member institutions of the Texas Medical Center are all nonprofit organizations devoted to research, education, patient care and the prevention of disease and injury. Members participate in various Texas Medical Center councils and other activities to ensure collaboration and communication. As founding dean, Dr. Hotez accepted the first class of the National School of Tropical Medicine at Baylor College of Medicine in the fall of 2012 – concrete realization of a vision he says has had most of his professional life. 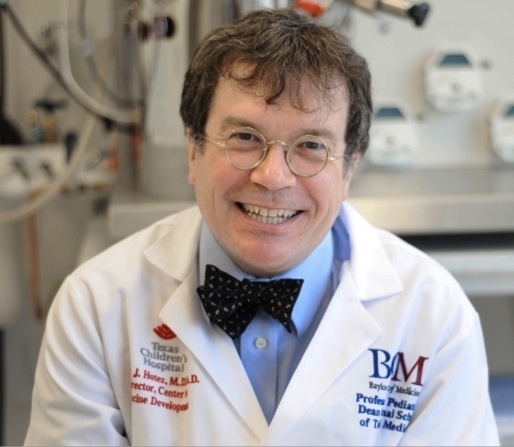 “I’ve always been impressed with the London School of Hygiene and Tropical Medicine and the Liverpool School of Tropical Medicine,” Dr. Hotez commented in a Baylor release. “There is no stand-alone school of tropical medicine in the United States – until now.” The Baylor school initially offers a diploma in tropical medicine to people in the health care field – physicians, nurses, public health experts, dentists, pharmacists, among others. 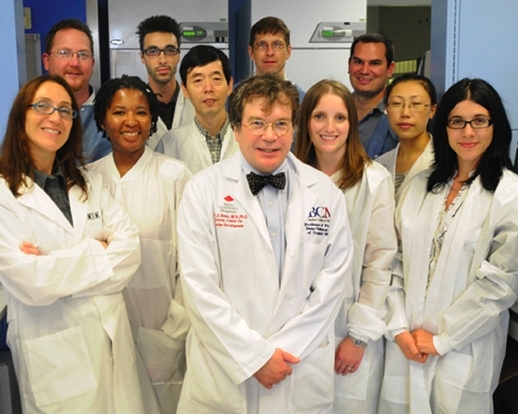 After obtaining his MD and PhD degrees from the Rockefeller University and Weil Cornell Medical College, Dr. Hotez has devoted 25 years of his life to developing innovations to combat NTDs, including new vaccines and drug packages. Since establishing the concept of NTDs in the biomedical literature in 2005, Dr, Hotez and colleagues around the world have helped shape science and the policy leading to deployment of rapid impact packages of donated medicines for NTDs for more than 364 million people in 25 countries across the developing world through the support of the U.S. government and the U.S. Agency for International Development (USAID). He cited, for example, that almost all children who live in extreme poverty have intestinal worms such as hookworms, which feed on blood and rob children of nutrients, and have actually been shown to reduce childhood intelligence and cognition with one result being reduction future wage earning capacity by 40% or more, not only occurring in the setting of poverty, but they actually being an active agent in causing poverty. Moreover, said Dr. Hotez, more than one-quarter of pregnant women in sub-Saharan Africa have hookworms and go into labor and delivery profoundly anemic infants, hookworm being a leading contributor to maternal morbidity in Africa, and NTDs in general having a particularly horrific impact on girls and women, another example being that as many as 100 million girls and women in sub-Saharan Africa are afflicted with female genital schistosomiasis (FGS) a parasitic infection that produces bleeding ulcers on the cervix, uterus and lower genital tract, also associated with a 3-4 increase in acquiring HIV/AIDS and possibly being Africa’s most important co- factor in its HIV/AIDS epidemic you have never heard of. Dr. Hotez observed in his testimony that if 100 million girls and women in the U.S. had FGS, our society would never tolerate it, but because it affects girls and women who live in abject poverty, mostly in remote parts of Africa, they go untreated. Yet another example of the NTDs is the disfiguring and stigmatizing effects of cutaneous leishmaniasis – also known as “Aleppo Ulcer” or “Aleppo Evil” now affecting more than 100,000 people living in Syria and who have fled to refugee camps, leaving girls and women permanently scarred and rendered unmarriageable or not allowed to hold their children as a result of this NTD. However, Dr. Hotez said the good news is that we can do something about seven of the most common NTDs, including hookworm and schistosomiasis (also known as snail fever), also lymphatic filariasis (elephantiasis), trachoma, river blindness, ascariasis (roundworm) and trichruiasis (whipworm) for an extraordinary low cost – on average 50 cents per year or even less to prevent and in some cases eliminate these diseases. He noted that in 2005 and 2006 a collaboration of colleagues from the UK and WHO and elsewhere proposed in the Public Library of Science (PLOS) the concept of a rapid impact package, and since 2006 this approach has been scaled up through support of USAID and with advocacy from our Global Network for Neglected Tropical Diseases, a Sabin initiative. Dr. Hotez credited generous drug donations from leading pharmaceutical companies, including Merck & Co. Inc., GlaxoSmithKline, Eisai, Johnson & Johnson, Merck Serono, and Pfizer, and the efforts of the USAID with facilitating a unique and innovative public/private partnership was formed to efficiently and cost effectively address NTD control and elimination. To date, he said, “USAID’s NTD Program has improved the lives more than 364 million people, delivered nearly 820 million NTD treatments, and trained over 500,000 community workers. It has exceeded expectations in its ability to deliver treatments for the seven most common NTDs, leveraging more than $4 billions of donated drugs, and operated in 25 countries such as Cambodia, Haiti, Indonesia, Nigeria, and Senegal.” He praised USAID’s NTD Program and the U.S. government’s steadfast and vital dedication to this fight, which he said has been instrumental in inspiring similar efforts by partner countries to initiate control programs and allocate funding, but warned that if funding for USAID’s NTD Program does not at least match FY 2013 levels, the capacity to deliver these medicines to those who need them most will be significantly reduced and we may see a resurgence of many of these NTDs. Furthermore, Dr. Hotez noted, momentum generated over the past few years could well stall if the United States steps back from its global leadership role in NTD control and elimination efforts. Dr. Hotez affirmed that we now need to look to “Version 2.0” of NTD control and elimination, better linking the USAID NTD Program to other USG global health initiatives such as PEPFAR as well as the Global Fund to Fight AIDS, TB, and Malaria. He noted that a recent victory published in PLOS found that when Global Fund support is used for NTDs it can actually lead to the elimination of an NTD in Africa, with the example being lymphatic filariasis – elephantiasis in Togo. He also contended that there is a need to encourage other government support beyond the U.S., expressing gratitude to the UK Government, which he credits with being a stalwart supporter of NTD control, and certain other European governments that have supported R&D efforts, but said other G20 countries have been underachievers when it comes to global NTD control and elimination support, ironic said Dr. Hotez, given that his new analysis published a few weeks ago in Foreign Policy found that more than half of serious NTDs actually occur among the poor living in G20 countries, especially India, Indonesia, and China. Dr. Hotez believes that a potentially important role of the new State Department Office of Global Health Diplomacy could include stepping up diplomatic pressure on the G20 to support NTD control and elimination. • Millions of African Americans with trichomoniasis linked with HIV/AIDS • Hundreds of thousands of Hispanics with Chagas disease, a debilitating heart condition • Tens of thousands of Hispanic Americans with cysticercosis a parasitic worm infection of the brain. 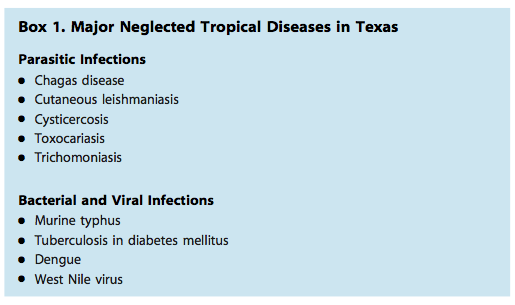 • Widespread arbovirus infections including dengue fever in Texas and Florida. Dr. Hotez emphasized that it’s important to emphasize that these are not rare diseases, and that scientists at the National School of Tropical Medicine are finding that these diseases are widespread in Texas and elsewhere in the American South, and are now investigating the basis for their links to being extremely poor. Of particular interest is their finding that there is actual transmission of many of these NTDs within U.S. borders, making them not a primarily a problem of immigration but rather a problem of extreme poverty, extraordinary magnitude and simultaneous neglect, noting that there is urgent need to expand our local and national surveillance efforts for these diseases and to investigate how these diseases are being transmitted, and to conduct R&D for new tools, i.e., drugs, diagnostics, and vaccines and that greater investment in NTD-related R&D for NTDs both globally and in the U.S. is needed to support the introduction of new technologies (e.g., drugs, vaccines and diagnostics); to ensure the achievement of the goals of disease control and elimination, as noted earlier, and address the urgent needs of particularly neglected patient populations. Dr. Hotez outlined how work in R&D includes development of novel, low-cost vaccines for NTDs — ironically for both developing countries and the U.S. He said vaccines against NTDs are considered to be cost-efficient, if not cost-saving, with the potential to avert the suffering of millions and hundreds of thousands of deaths annually, but although the pharmaceutical sector has the knowledge base and resources to create therapies or possible vaccine candidates, there is little potential market for these new technologies and the institutions are forced to use alternative market mechanisms to spur research and development. For example, the Sabin Vaccine Institute’s non-profit product development partnership (PDP) based at the National School of Tropical Medicine at Baylor College of Medicine is helping to fill this gap and that drawing on over a decade of experience, the Sabin PDP has created a comprehensive, relatively low-cost model that serves as a blueprint for vaccine development and ongoing efforts to fight public health threats that adversely impact more than one billion people worldwide. Three of Sabin’s vaccine candidates are either currently undergoing clinical testing or moving into clinical testing this year. Currently, Dr. Hotez noted, the vaccine pipeline is largely concentrated on the pre-clinical through phase II stages of clinical development, but projections suggest that up to a handful of new neglected disease vaccines will be approved in the coming years because of the impressive work coming out of the PDPs. However, since later stage clinical trials are much more costly than earlier stage development, increased costs remain an important obstacle, and while strong support has come from the Bill & Melinda Gates Foundation during the last decade, the Foundation does not have sufficient resources available to cover the needs that lie ahead, so other sources of funding will be necessary to support product development for the world’s poor. Dr. Hotez’s mission and passion is to keep the battle against NTDs front and center.